Curious about International Adoption, but not sure where to go for reliable information? Adoption STAR is full of good resources for you to start your research to determine if International Adoption is a good fit for your family and we are happy to answer questions along the way. At first International Adoption might seem overwhelming, but if you are already considering adoption, you might find that after a little research on the options in International Adoption, that it might not be that far fetched from the vision you have for your family. There is definitely a significant cost to adoption. When adopting from abroad, there are typically government fees in both countries in addition to possible fees to both your placement agency ( the agency who works in the country you wish to adopt from) as well as your home study agency ( the agency who conducts your home study when your placement agency is not in the state which you reside), and of course costs for travel. However, since the Adoption Tax Credit is not permanently extended we hope that many families will be able to take advantage of it for years to come. I hear the eligibility requirements are strict, I probably won’t even qualify? Each country program sets their own eligibility requirements. You can easily find out what the requirements for prospectve adoptive parents are by using your google search engine or accessing sites such as www.adoption.state.gov where you can search by country to read generally speaking about the process for a given country. You will quickly find, that some programs are open to singles, older parents, families where there are other children in the home, etc. From there you can search for agencies with the country programs you are interested in learning more about and find out the specifics that might make the program a good fit or not for your family. The wait in International Adoption is rarely predictable – but, then again when was adding a child to your family predictable? Most agencies will be cautious in their estimates of what the wait time might be, or say there is no set wait time but, give you an idea of what other families have experiences in the program. Additionally, oftentimes if a family is looking to adopt a child with known medical/special needs, an older child or a sibling group, they might discover that their wait time from completing their application to the country from which they are adopting to the time they receive a referral (child’s paperwork received as a potential adoptive match), is not as long as they had imagined. I always say “prepare for the worst” – in the end it seems unlikely that you will look back with disappointment on the process if you have prepared yourself the best way that you can for how terrible the wait might be, for the worries about whether you will be able to find the strength to carry-on through the process, for the concern about your child’s well-being once you have seen their sweet smile and you are just waiting for that final approval that allows you to take them in your arms forever, and for the long road ahead as you figure out how to parent this mystery of a child – but, in the end you will be with your child(ren) – the one meant for your family. Do all Internationally Adopted children have attachment issues? I will have regular posts on our blog about International Adoption so feel free to contact Adoption STAR at anytime with your questions. Megan Montgomery is a licensed clinical social worker with a Master’s degree in Social Work from the State University of New York at Buffalo. She obtained her undergraduate degree in social work from the State University of New York at Fredonia. 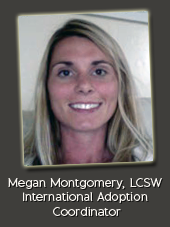 Meg has worked within the adoption field for many years. She was the Social Work Manager at an international adoption agency providing adoption services through China. Meg’s experience as a social worker also includes working with children with social emotional disorders and/or behavioral challenges and their families.